I have my pictures of the new start. I just wanted to have a decent start to show. 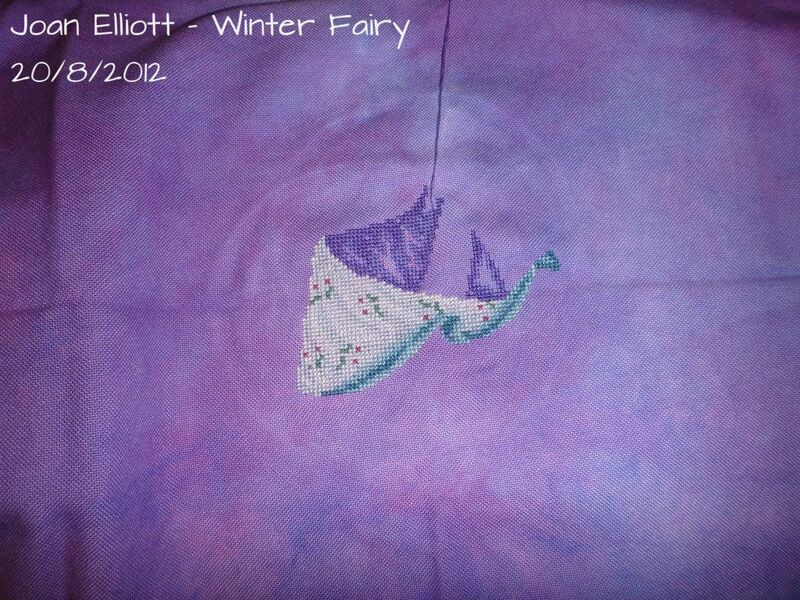 I finally grabbed out my fabric and threads for Joan Elliott's Winter Fairy. I was kinda scared to touch it because being polstitches fabric I can't wash it when it's finish and there is a lot of white in this piece. A lot of the bottom of her dress is white as you can see so I am going to have to be very careful. So here is my new start. Of course the purple of the fabric hasn't been captured properly it's quite a bit redder rather than bluer. I love this piece and am so excited to finally be working on it. On a sadder note, Phill's grandma died at 93 this past week so we have to fly down to Canberra for the funeral. So much for saving money... We fly tomorrow so I won't be around for a couple of days. Hope it isn't to hard. Oh and to make it more annoying I can't take any stitching on the plane as cross stitch needles aren't allowed but I can take knitting ... go figure! Looking great! I love Joans seasonal fairies! The Winter Fairy ist beautiful. I wish you Happy Stitching. Great start, you did quite a lot already. I hope that you will ave a lot of fun with this piece. Wow it is so sweet. Congratulations on your new start! You have really gotten a lot done on this new start. She is beautiful! Winter Fairy is looking lovely and the fabric is so nice too. You made a great start and the fabric is lovely!! I have to confess, I've taken my stitching on the plane the last 3 trips I've had. Haven't been stopped and questioned yet! Great new start! Sorry about your loss. Nice start, soon you'll be back and make a great progress on your stitching. Needles are not allowed on planes, right? Congrats on the new start. She is going to be beautiful. Sorry for your loss. this design is wonderful !!! you'll make a great piece for sure ! Your new project is looking amazing! Love the fabric! I am sorry to hear about the loss, but 93 is a high age and I am sure she enjoyed her life. Love Joan Elliott designs - and that one is fantastic! The fabric you're working on is amazing, it will really make a difference to the design. Can't wait to see more of it! Great start on a lovely new project. Wow what fantastic fabric you're using!!! That's weird about the knitting versus cross stitch needles. I have brought cross stitch needles on planes before in the U.S. no problem. Gorgeous stitching! So sorry about your grandma, hugs to Phil. Take the needle, NEVER heard that, I fly across the Atlantic a LOT and have taken needles, knitting needles (bamboo) and scissors (small ones that I don't mind losing) and have occasionally been asked to show them but never had anything confiscated. Condolences on Phill's loss - my own grandma was 92 when she left us, but it is still very hard, despite knowing that they had a good innings. Congratulations on the lovely start - I have JE's Renaissance ladies on my to do list,but have yet to pluck up the courage to set needle to fabric. Sorry for your loss. 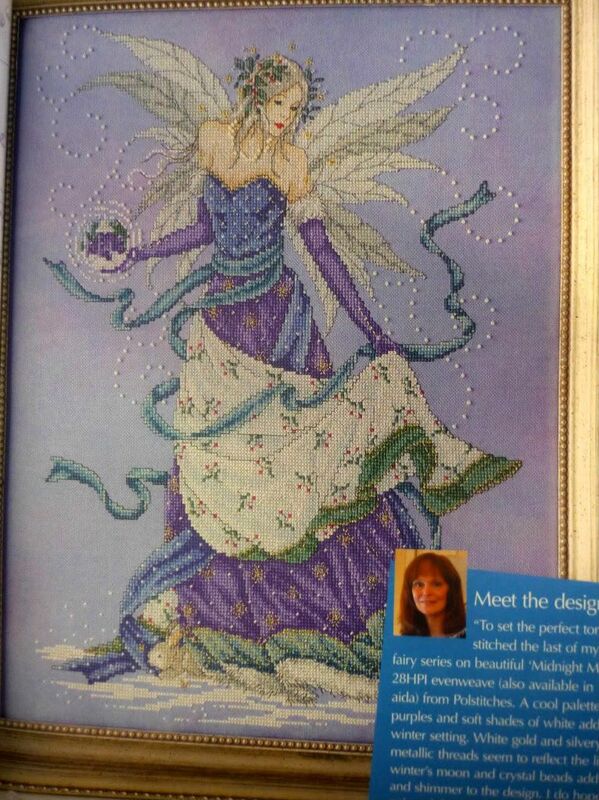 Great new start on Winter fairy.